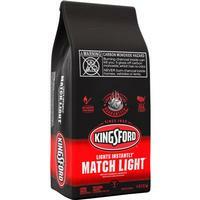 Kingsford Original Charcoal Briquettes make grilling fun and easy. Designed with Sure Fire Grooves, Kingsford Original Charcoal Briquettes have more edges for improved airflow and faster lighting which ensures long burning performance as compared to other nationally available charcoal brands. These coals for grilling heat quickly and are ready to cook on in about 15 minutes. That's 25% faster than other nationally available charcoal brands. Kingsford Original Charcoal Briquettes are made in the USA with 100% natural North American ingredients and real wood to deliver an authentic smoky flavor, the way BBQ should taste. Real charcoal flames. Real wood smoke. Real fire-grilled flavor. Ideal for use in restaurants, cafeterias and other food service facilities. Add Kingsford Original Charcoal Briquettes to your barbecue supplies and make all your cookouts delicious.